Oceans Reef & Aquariums (ORA®) have announced they have succeeded in commercially breeding Mandarins. The advantage of these captive bred mandarins from ORA, is that they are conditioned to eat frozen food, and therefore are much less likely to suffer from starvation. We should have photos for you from the Global Pet Expo in Orlando this coming weekend. 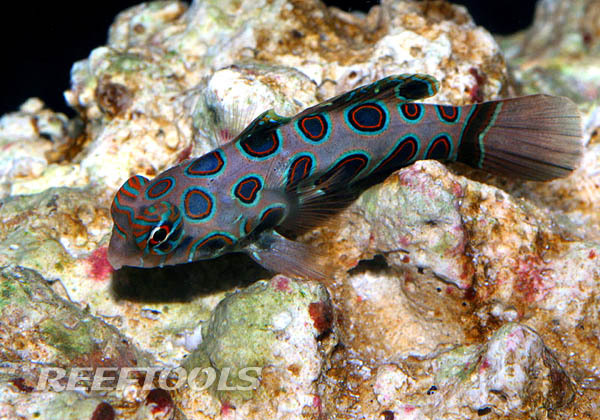 For many years marine aquarium hobbyists have been captivated by the exquisite beauty of Mandarin Gobies (actually Dragonettes). Their popularity, however, is tempered by the fact that they are difficult to feed in captivity and are subject to questionable collection practices in the wild. Unfortunately, most Mandarins succumb to starvation in home aquariums, even with the best intentions and attempts at feeding. Thankfully, all of that is about to change. ORA biologists have succeeded in developing the methods needed to breed and raise commercial numbers of the two species of Mandarins, the Blue Mandarin (Synchiropus splendidus) and the Spotted Mandarin (Synchiropus picturatus). Building on the early success of breeders such as Julian Sprung, Wolfgang Mai, and more recently Matt Wittenrich, ORA is now poised to have commercially bred Mandarins available to everyone. The significance of this cannot be understated as it is a major advance in marine aquaculture and solves many of the problems associated with keeping these species. Just as the first captive bred Seahorses were trained to eat frozen foods, ORA has already trained our baby Mandarins to eat commercially available frozen diets. This fact alone makes them easy to feed and care for, and the average aquarist will delight in not having to worry about sources of live food for their finicky eaters. Our goal is to have them soon weaned onto a pellet diet. We expect to have these fish eating pelletized foods before being released for sale. ORA is the leader in bringing the marine aquarium industry new and exciting aquacultured species. With the addition of Mandarins to our ever-growing list, a major milestone in aquaculture has been achieved. We are sure that our retail customers and hobbyists alike will be elated that captive raised Mandarins are finally available and that a page has been turned in the tragic history of this beloved aquarium fish. We expect to have significant numbers of Spotted Mandarins available this summer. Blue and Red Mandarins will be available in more limited quantities around the same time. That is awesome – aquarists and hobby store owners owe it to the hobby to back ORA 110% on this – it should no longer be acceptable to sell animals into aquariums we know they are destined to starve in! AWESOME. I’m very glad to hear this and will definitely be snatching myself a pair for my tank. This is so exciting! Bravo, ORA®! This is great and couldnt agree more..
Any idea what these will sell for (ballpark)?